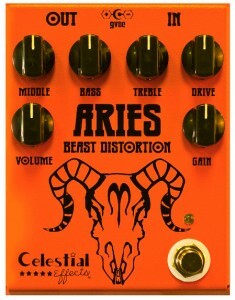 The giveaway for the Celestial Effects Aries Beast Distortion is over and it’s time to pick the winner. This giveaway was a huge amount of fun. We met lots of folks emailing and asking us via social media about the pedal which is always awesome. The contest also gave us a change to dig deep into this cosmically named builder. On one day, we did a run down of the 12 pedals in their Zodiac line. On another day we brought you ‘10 Things You Didn’t Know About Celestial Effects‘ and just this last Monday we posted a review of the Aries Beast Distortion. To us, that’s what these giveaways are all about. Not only giving folks a chance to win an amazing pedal, but to give folks a chance to learn more about the people and the company behind the effects, because these people and their passion tell us a lot about what’s inside their boxes. And now what you’ve been waiting for: The winner of the Celestial Effects Aries Beast Distortion is Treyton J of Aurora Colorado. Congratulations Treyton! We’ll make sure to touch base with him after he gets it into his hands to get a personal review. For the rest of you contest hopefuls, don’t despair. We have yet another giveaway coming up and it’s a good one. Until then.